Ukraine’s State Security Agency had earlier described Mr. Strelkov as an active-duty officer of Russia’s elite Main Intelligence Department. Mr. Strelkov didn’t directly address the Russian reporter’s question about possible Russian military-intelligence involvement in his mission. The commander also didn’t speak about himself or his background. Moscow has denied its involvement in the unrest in eastern Ukraine. Most of the men in the command possess war experience, including former service in the Russian or Ukrainian militaries and tours in Chechnya, Central Asia, the former Yugoslavia and Iraq, according to Mr. Strelkov. He said some “even managed to visit” Syria. The slim, middle-aged commander with a trimmed mustache has risen to become one of the most important figures in the rebellion in Ukraine’s east, emerging as the de facto military leader of a pro-Russia uprising that has threatened to split the country. His tight operation of highly skilled militants offers a serious challenge to the new pro-Europe authorities in Kiev. 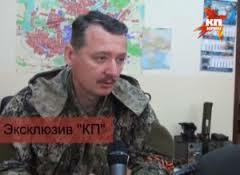 A man also named Igor Strelkov, working with an elite intelligence regiment of Russian paratroopers, had been involved in a 2001 “kidnapping” of a Chechen man during the Russian war in the breakaway republic, according to Chechnya’s human rights ombudsman’s website, which said the incident occurred near the village of Khattuni. It couldn’t be determined if it was the same Mr. Strelkov.